The music for My Irish Molly O was composed by Jean Schwartz, while the lyrics were written by William Jerome (around 1905). This version is by the Dublin City Ramblers - an Irish Folk Band originating from Dublin, Ireland. Level Of Ease: Fairly Easy. The trickiest chords are the B7 and Gmaj7 (see tip below), but with practice they will become very easy to play. 4/4 time: This means 4 quarter-note/crotchet beats per bar, therefore the count is | 1 2 3 4 | or | ♩ ♩ ♩ ♩ | etc. The top number indicates the number of beats in each bar - in this case 4 beats, while the bottom number indicates the note value of each beat - in this case a quarter-note or crotchet beat. Tempo: moderate at around 108 - 110 bpm with a 'slow-down' at the end of each verse going into each chorus. We call it 'poetic licence', and it works well here. If you are playing with a metronome, there are some handy sites that offer a free metronome on-line. These are excellent for practice sessions. G chord: Play the G chord using fingers 2, 3 & 4. Gmaj7 chord: Lift the 4th finger from string 1 (3rd fret) and replace it with the 1st finger on the 1st string (2nd fret). Pretend you are playing a G7 chord, and instead of placing your first finger on the 1st string, 1st fret, place it on the first string, 2nd fret. 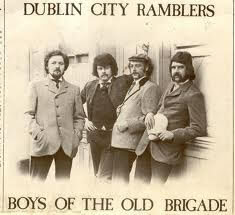 The Dublin City Ramblers were formed in 1970. Band members consisted of Patsy Watchorn, Mick Crotty, Sean McGuiness, and Kevin Gerahty. In 1972 Mick and Kevin left the band, and were replaced by Philip McCaffrey on fiddle, and Kevin Molloy on guitar and vocals. It was during this time, the band scored a Top 10 hit with their album, A Nation Once Again. During the 80's, the band went on to record many famous hits including, The Rare Ould Times, John O'Dreams, and Wind in the Willows. In the late 80's, Philip and Kevin left the band, making way for Paddy Sweeney from The Barleycorn. In 1992, Shay Kavanagh joined the band, and this line-up continued until 1995. Patsy Watchorn's left the band in 1995 to pursue a solo career and in 2005, he joined The Dubliners, taking the place of the great Paddy Reilly. In 2002 Paddy and Shay left the band, and since then there has been an array of members joining and leaving the band. In the last decade, The Dublin City Ramblers have continued to tour as a 3 piece with Sean McGuinness, the only existing original member. My Irish Molly by The Dublin City Ramblers is featured on the compilation album Best Loved Irish Songs . THE DUBLIN CITY RAMBLERS chords and lyrics are property and copyright of their owners. "My Irish Molly O" chords and lyrics are provided for educational purposes and personal use only.